Epicur, Sobre el Placer y la Felicidad. Born at Samos, at 18 visited Athens, and then returned to Asia. Opened a school at Mitylene in 310 BCE and also taught at Lampsacus. Returned to Athens in 305 and established a very successful school of philosophy. According to Diogenes Laertius, he left 300 volumes on Natural Philosophy, Justice, The Chief Good &c. The principal sources of our knowledge of the doctrines of Epicurus are Cicero, Plutarch and Lucretius. Epicurus is currently considered a "single author." If one or more works are by a distinct, homonymous authors, go ahead and split the author. 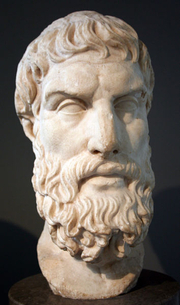 Epicurus is composed of 12 names. You can examine and separate out names.